I love when we get to spend a whole weekend with our couples. We arrived in South Lake Tahoe and scouted out a bunch of locations for photos, all of it feeling very nostalgic. Nate and I spent part of our honeymoon there, so the bright blue water, dusty trails, and windy roads all felt very familiar. I remember blissfully celebrating our marriage while hiking the trails that lead us to the Pacific Crest Trail. That night we watched the sun go down in the same place we did while on our honeymoon, and I realized how special it was to be sharing this place with our couple. We met Ali at her grandparents’ home the night before the wedding and soon we rushed off to meet Marcus at another house just on the other side of the California border. They realized that their officiant was only licensed to perform marriages in California, not Nevada (the wedding was to be held in a meadow RIGHT on the Nevada side of the border). So we watched as they had a tiny marriage ceremony in the kitchen of a rental house in California, all their friends (and dogs) around to witness. It was perfectly casual and lacked all pretense as they signed the marriage license on the kitchen counter. The next morning we got up for the planned thing. Ali got ready with her ladies and strapped on some heeled hiking boots before heading out for a hike where she would read her vows privately with Marcus. 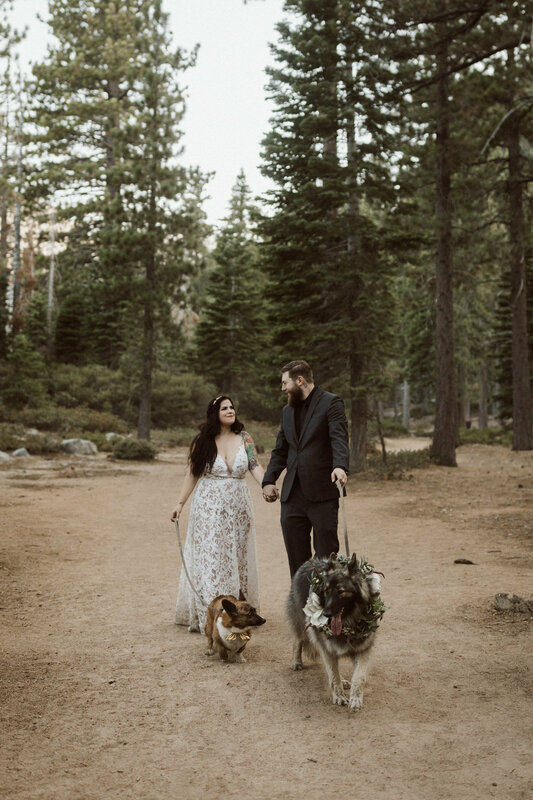 She hiked in her dress with Naga in tow, her fluffy old Shiloh Shepherd, and Marcus took Zuko, the sweetest lil corgi. They met with a first look by the falls while the dogs splashed in the water. 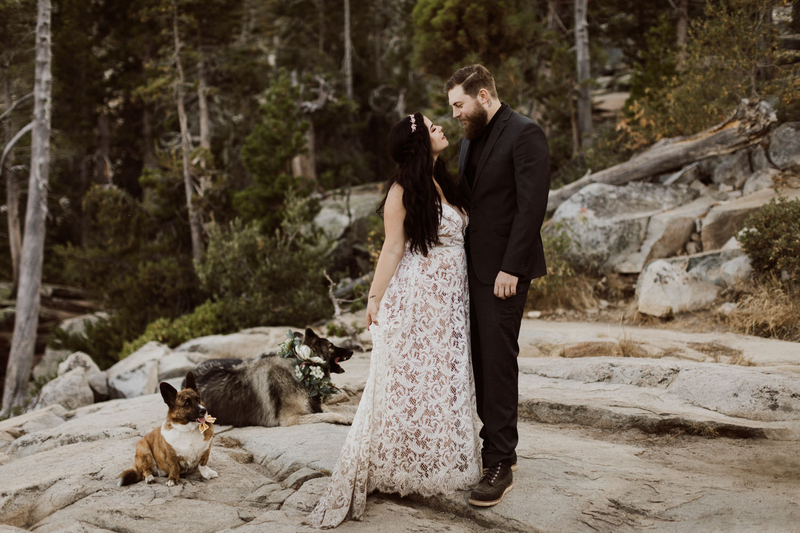 They read their vows and cuddled their pups, officially becoming a family together. Then we hiked back to meet their families in a meadow. Ali & Marcus celebrated their wedding in a meadow while the sun went below the horizon and their families watched. After they kissed, the dogs ran up to them, jumping and licking excitedly, as though they somehow knew the significance of the moment. The following morning, we got up before the sun and drove to the other side of the lake to watch the sun come up. We made coffee on the beach and watched as sailboats began pulling their sails and early risers started on their paddle boards. I love sunrises. They are soft and always bring a sort of stillness with them. Capturing Ali & Marcus on their first day as a married couple was so sweet. A lot of simple smiles and tight squeezes as they settled into their official life together. Cedar & Pines is a traveling wedding photographer duo made up of Nate and Megan Kantor, a married couple based in the Rocky Mountains of Colorado and the West. They believe in honest wedding photography, capturing the small candid moments to the epic landscape views. They travel to photograph intimate weddings and adventure elopements from the mountains of Colorado to destination weddings in California, Utah, New Mexico, Arizona, Wyoming, Washington, Patagonia and the ends of the earth.